Paris, collection of Jean-Baptiste Laurence Boyer de Fonscolombe (1719-1788, pastellist). His sale, Paris, January 18ff, 1790, lot 74: “GILLOT . . . Une Mascarade, dans l’intérieur d’un bois, vue au clair de lune. Six principaux personages se distinguent à la lumiere d’un flambeau. Une belle couleur & une touché spirituelle distinguent cette production. Hauteur 16 pouces & demi, largeur 20 pouces. T.” Sold for 20 livres to François André according to an annotated copy of the catalogue in the Rijksbureau voor Kunsthistorische Documentatie. Goncourt, Catalogue raisonné (1875), under cat. 69. Dacier, Vuaflart, and Hérold, Jean de Jullienne et les graveurs (1921-29), under cat. 271. Macchia and Montagni, L’opera completa di Watteau (1968), under cat. 188. Washington, Paris, Berlin, Watteau 1684-1721 (1984), under cat. P65. Since the original Watteau painting has been in the German royal collection since the mid-eighteenth century, the one owned by Martin has to have been a copy. There is nothing to guarantee that the paintings sold in 1776 and 1790 refer to the same painting but this association seems likely. They were essentially the same size and both were described not only as being nocturnes, but also as having six principal characters, a distinctive notion for pictures portraying a dozen actors. In the fourteen years between the two sales, there was a notable change in the way the two were seen. While earlier the painting was attributed to Watteau, the second time around it was given to Gillot—a notable drop in esteem—and the selling price dropped from almost 400 livres to just 20 livres. Lejeune, Guide théorique et practique (18…), 3: 323. Adhémar, Watteau (1950), under cat. 204. According to Lejeune, this copy of L’Amour au theater italien was by Watteau du Lille but that is by no means a secure attribution. 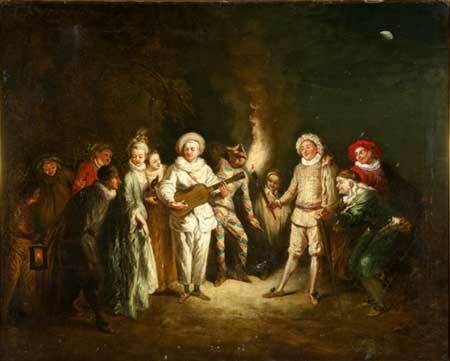 Adhémar wondered if the Loze painting might not have been the one in the 1850 sale of the Wilson collection, probably because she was unaware of any other copies of this Watteau composition. Washington, Paris, and Berlin, Watteau 1684-1721 (1984), under cat. P65. Despite the claim that this picture was a preparatory sketch for the version in Berlin, a ploy often used to explain copies, Watteau did not make full painted sketches and, more importantly, this work suffers from being of poor quality. It has no apparent relationship with Watteau’s style. 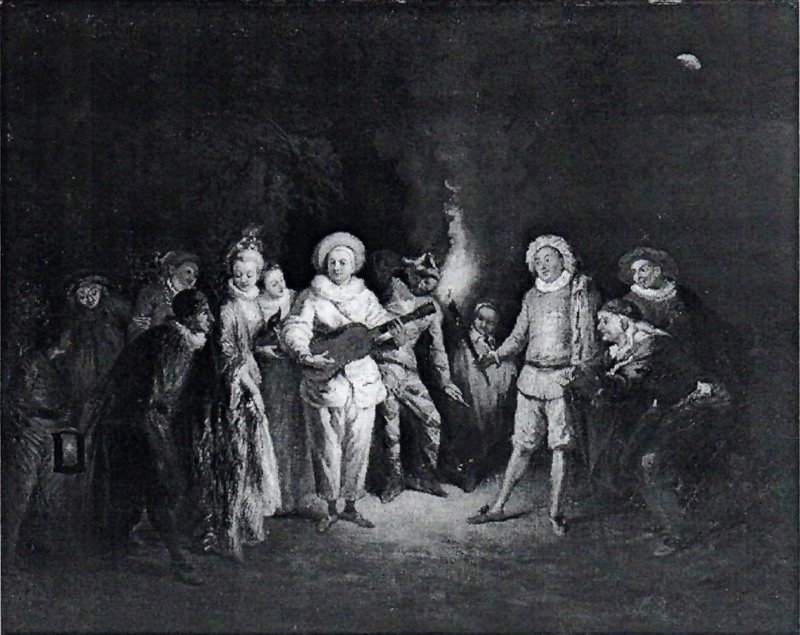 Paris, Hôtel Drouot-Richelieu (Rossini), December 12, 2005, lot 121: “WATTEAU Antoine (D’après) . . . L’Amour au théâtre italien / Huile sur toile / Copie du XIXe siècle de la composition (1718) conservé au musée de Berlin. haut. 59 – larg. : 73cm 1 500/2 000 € / (Voir la reproduction)” Sold for €1,700. London, Sotheby’s Olympia, April 25, 2006, lot 414: “AFTER JEAN ANTOINE WATTEAU / ACTORS OF THE ITALIAN COMMEDIA DELL’ARTE / oil on canvas / 59.3 by 73.5 cm. ; 23 3/8 by 29 in. / A later copy after Watteau’s original in the Staatliche Museen, Berlin (see G. Macchia, L’Opera Completa di Watteau, Milan, 1968, p. 118, cat. no. 188, reproduced). £2,000-3,000 / €2,950-4,450).” Sold for £2,640 ($4,703). Paris, Washington, Berlin, Watteau 1684-1721 (1984), under cat. 65. Whether the painting’s origin is nineteenth century as was claimed in 2005, or was executed still more recently, it does not appear to be from the eighteenth century. It is of extremely poor quality. 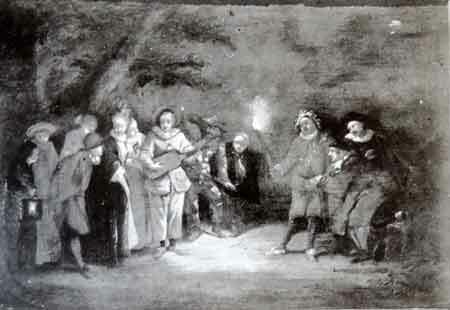 Rosenberg, judging from a photograph, described it as a “mediocre copy.” It imitates the whole of Watteau’s composition save that it omits the actor with the lantern at the far left. Sale, pre-1950, Wilson collection, cat. 750. 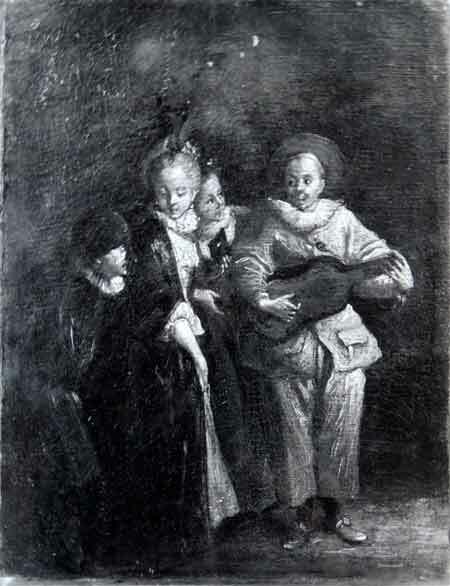 Adhémar, Watteau (1950), under. cat. 204. Paris, Petit Palais, Chefs-d'œuvre des musées de Berlin (1951), under cat. 58. It has not been possible to trace this painting. Nothing is known about it save for a vague reference by Adhémar in 1950. Belgium, private collection prior to 1977. According to Ferré, this painting was sold at an otherwise unidentified pre-1947 auction of works owned by “inciviques” (wartime collaborators?). 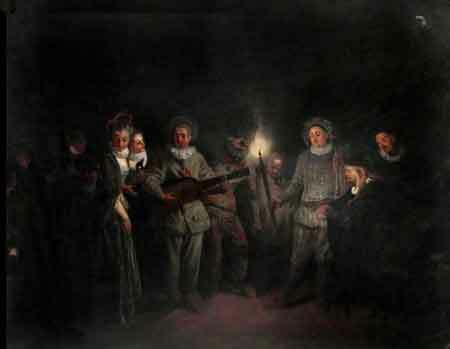 Turin, sale, Casa d’aste Della Rocca, February 22, 2011, lot 425: after Jean Antoine Watteau, Concertino di commedianti, oil on canvas, 83 x 102 cm, estimate €4,300-5,000. Bought in. Lindau (Bodensee), Germany, sale, September 24, 2011, lot 2751: follower of Jean Antoine Watteau, L’Amour au théâtre italien, oil on canvas, 82 x 102.5 cm. Estimate €2,300. Sold for €3,000. Paris, Musée de la Monnaie, Pélerinage à Watteau (1977), cat. 305 (by l’école française, L’Amour au théâtre italien, lent by a private collector). Given its Belgian provenance, one might wonder if this is the same painting as copy 2 listed above. It was not illustrated in the 1977 catalogue. Given the unusually large size cited in the 1977 catalogue (88 x 122 cm), it is tempting to link that painting with the slightly smaller one sold in Turin and Bodensee in 2011 (83 x 102 cm). In 1984, Rosenberg described the painting as a “pastiche absolu” whereas the painting under consideration here is a straightforward copy of L’Amour au theater italien. However, the specific phrase “pastiche absolu” was a borrowed term that Rosenberg incorrectly applied to this version. In the 1977 catalogue the phrase was applied to another painting (cat. 306), a pastiche employing elements from L’Amour au théâtre français and Le Plaisir pastoral. Nancy(? ), collecion of Victor Poirel; by descent to his widow who donated it to the museum in October 1884. Nancy, Musée, Catalogue descriptif (1909), cat. 56. Bouleau, Inventaire des tableaux (1991), cat. 103. 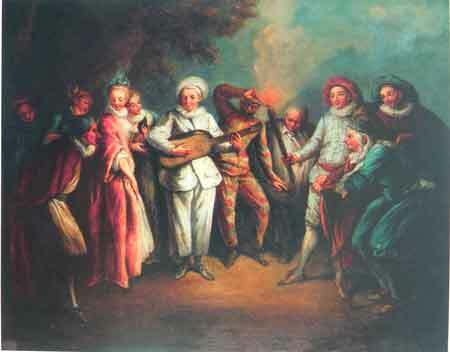 This picture is a reduced copy of just four of the characters left of center in Watteau’s picture. The plaque on the frame is marked “FURINACCIO. XVIIIe Siècle” which tells us how the painting passed in the nineteenth century, namely as a work by this relatively obscure Italian painter known for portrayals of the commedia dell’arte.